Steven (Chicagoland, United States) on 19 March 2019 in Plant & Nature and Portfolio. Spotted at the Garfield Park Conservatory on February 2, 2019. Elle est superbe lovée dans son écrin de vert. A very nice plant and a beautiful pink color. Pink ginger? We actually have red ginger in Malaysia. Its red is deeper though. 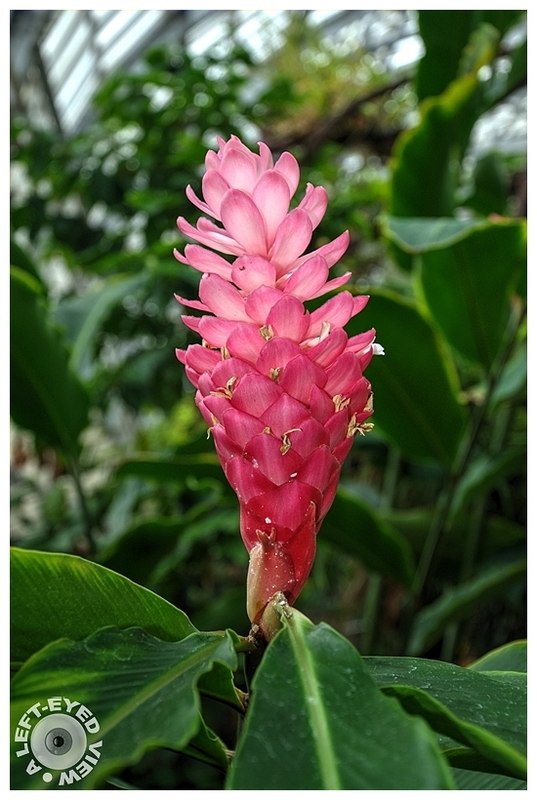 I posted some red ginger pictures just a few days ago. wonderful blossom !!! The contrast is beautiful ! A nice capture of this flower. Excellent detail and great background. Oh so that is called a ginger lily! Is there any edible part on the plant? Exotic! A beautiful photo of this pink beauty. This is gorgeous! I love the color. A stunning flower. A lovely flower that I got to see in Hawaii and a few other places. Such an elegant specimen, standing out beautifully with your focus and framing. Jolie, jolie, jolie cette fleur qui monte au ciel. a lovely tropical bloom. I might prefer a slightly different viewpoint that hid the greenhouse roof. That's a real beauty - and you caught a bit of back lighting! Très belle lumière: la photo est superbe!